Jhanwar road, Naranadi, Jodhpur (Raj).342001. India. Abstract: Sialolithiasis accounts for the most etiology of salivary gland obstruction which leads to recurrent painful swelling of the involved gland which often exacerbates while eating. Stones may be encountered in any of the salivary glands but most frequently in the submandibular gland and its duct. Very few cases of giant submandibular sialoliths with intraoral perforations have been reported in literature. We report the case of a fifty year male patient who had a giant submandibular sialolith which led to erosion of the floor of the mouth. Orthopantomograph was used to confirm the clinical diagnosis. 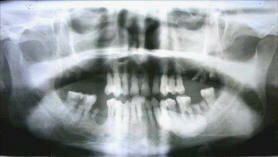 The sialolith was removed with intraoral approach and no postoperative complications were noted. The article also reviews the various available diagnostic modalities and treatment options. Figure 1. Sialolith eroding the floor of mouth. Figure 2. OPG showing well radioopaque mass. Few is any systemic disorders are associated with sialolith formation, with the exception of gout which may predispose to sialolith formation.8 In the literature, sialoliths measuring more than 15 millimetres (mm) were considered rare,9 various reports of submandibular sialoliths measuring between 23mm and 31mm have been reported.4,8 The sialolith observed in our case was quite large, measuring approximately 38mm and was associated with erosion of the floor of the mouth, making this reported case extremely rare. CT sialography has been used to delineate the ductal system of the submandibular gland, this technique demonstrates the soft tissue of gland and ductal system with 3D reconstruction that avoids superimposition of anatomic structures. This technique has similar disadvantages that are seen with other sialographic techniques.12 Magnetic resonance sialography (MRS) is a new technique that is considered an excellent radiological modality for the diagnosis of sialolithiasis.13 MRS may be indicated in cases of acute infection where other sialographic techniques are contraindicated since MRS does not require cannulation of the duct.11 Other advantages of this technique are the low radiation doses and the lack of pain associated with procedure.13,14 The disadvantages of this technique include claustrophobia, cost factors, artifacts and contraindication in patients with cardiac pacemakers. Diagnostic sialadenoscopy is a newer technique in which the complete ductal system can be explored. It provides direct and reliable diagnostic information of ductal pathologies. The need for technical perfection is the only limitation of this technique. The algorithm for the treatment of sialolithiasis depends upon the location and size of the sialolith. In case of small sialoliths, conservative methods such as proper hydration of the patient, application of moist warm heat and massaging the gland in conjunction with sialogogues may be considered.13 Small stones can also be milked out through ductal orifices by bimanual palpation. Zudin KJ et al. found that transoral removal is the treatment of choice for submandibular sialoliths which can be bimanually palpated and localized by ultrasonography.15 Sialodochoplasty can be performed to remove the submandibular sialoliths which are located close to the orifice of Warthin's duct. To remove the stones distal to the punctum, a transverse incision can be made distally on the stone taking care not to injure the lingual nerve injury,9 as performed in our case. Batori M et al. reported a case of a 13 mm submandibular sialolith which was treated by complete surgical removal of the gland.5 In the management of large sialoliths which are located in the close proximal duct, extracorporeal shock wave lithotripsy (ESWL) can be considered. Endoscopic intracorporeal shock wave lithotripsy (EISWL) is also gaining importance because of less damage to the adjacent tissues during the procedure.9 Sialadenoscopy, which is a non invasive technique can be use to manage large sialoliths as well as ductal obliteration. CO2 laser, because of its advantages of minimal bleeding, less scarring, clear vision and minimal post operative complications, is gaining its popularity in the treatment of sialolithiasis. Conclusion: Although various advanced diagnostic and treatment modalities have emerged in the management of sialoliths, the conventional techniques retain their popularity to date. We have reported a case of giant submandibular sialolith with erosion of floor of mouth which was diagnosed clinically and radiographically and treated with no postoperative complications. 6. Dalkiz M, Dogan N, Beydemir B. Sialolithiasis (salivary stone). Turk J Med Sci. 2001; 31:177-179.